One in three women will be beaten or raped within their lifetime. This frightening statistic is what motivates the organizers of the One Billion Rising campaign, an initiative that has been calling for awareness and prevention of violence against women since it was launched in 2012. The Network to Eliminate Violence in Relationships (NEVR), a KPU-based advocacy group, held an event on Feb. 21 to take part in the One Billion Rising movement and to share the aims of other organisations in the Metro Vancouver area that support women and victims of violence. During the hour-long presentation, nine speakers took to the podium to talk about their involvement in the One Billion Rising movement. Glenda Klassen, member of the Cree First Nation and Elder for Atira, conducted the opening ceremony with a territorial acknowledgement and song. Klassen was followed by a welcome to the university by KPU Vice President Academic Dr. Sal Ferreras and an address from the Mayor of Surrey, Linda Hepner. Hepner thanked all of the parties involved in organising the event and vocalised her support of women’s rights issues. “One of the four priorities in this city’s public safety strategy is to support vulnerable people, and we are doing that with our Inter-Agency Case Assessment Team—or what we like to call ICAT—that bring together community partners and service agencies that assist in Surrey’s RCMP domestic violence unit,” said Hepner on stage. A nursing instructor at KPU and facilitator with NEVR, Dr. Balbir Gurm, later spoke about her inspiration for being a part of One Billion Rising. 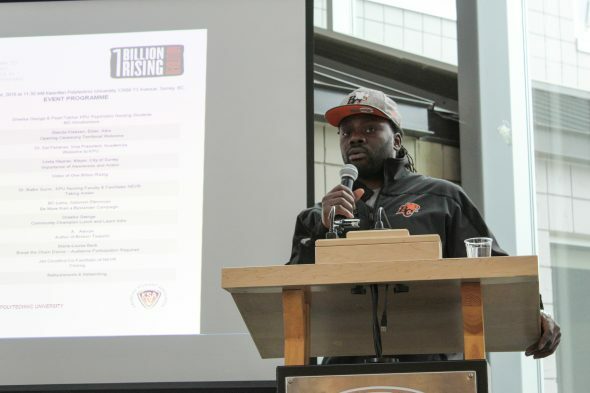 Shortly after Gurm returned to her seat, Solomon Elimimian of the BC Lions took to the stage. Elimimian grew up in interstate Los Angeles where he was raised in a loving, non-violent home, but he still worries about the children who witness violence against women while growing up. He says that he felt deeply impacted by the statistics emphasized by One Billion Rising and the Be More Than a Bystander campaign that he is representative of. Before attendees were taught the “Break the Chain Dance”—a choreographed dance to an anti-violence anthem employed by One Billion Rising—local poet Andrea Alexon provided a reading of three poems from her book, Broken Teapots. As a survivor of an abusive marriage, Alexon writes largely about her experience with interpersonal violence. The student leading the dance lesson, Marie-Louise Beck, is enrolled in KPU’s psychiatric nursing program. She feels that interpersonal violence is a common issue for patients and practitioners in her field. This motivated her to volunteer on Feb. 21. “If we can stop relationship violence before it begins, I think it would make a big difference worldwide and in psychiatric nursing, in registered nursing, in health care in general, in the world in general,” she says.